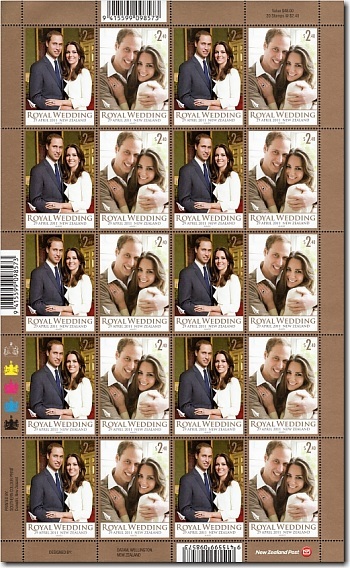 The Royal Wedding commemorative issue comprises two $2.40 stamps (the correct postage for a letter from New Zealand to the United Kingdom) featuring the official engagement portraits within a gold border. 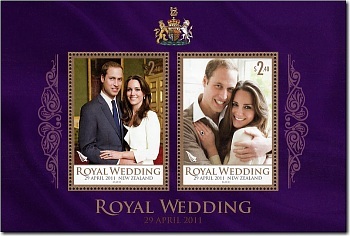 A presentation pack including the miniature sheet, se-tenant block and first day cover was issued with an "in-depth commentary" on the Royal couple. Embarrassingly, this commentary stated that the Prince was born on the 21st of May 1982 when he was, in fact, born on June the 21st. Unsold copies of the pack were withdrawn and reprinted with the correct date. The stamps were issued in sheetlets of 20 stamps and a miniature sheet featuring both stamps with Prince William's Coat of Arms above the portraits.